Prepare a mixture (enough to fill your coffeepot) of 1 part white vinegar to 2 parts cold water. Feel free to use a stronger solution if this is the first time you've cleaned your coffeepot in a long time. Make sure there's no coffee grounds in the filter basket. Pour the mixture into the reservoir where regular water would normally go. Let the machine brew the whole pot, then let it sit for fifteen minutes. Dump the spent vinegar water and, if needed, clean out your pot with a sponge. Fill up the reservoir with cold, clean water, and run the machine again. After this first rinse, give the machine a sniff test. If you still smell vinegar, do a second rinse cycle. If not, CONGRATULATIONS! Your machine is ready to brew delicious coffee. 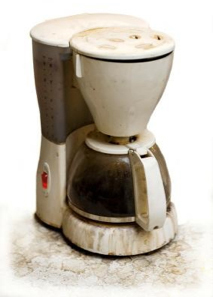 Keep in mind that neither soap nor baking soda should ever be used inside any part of a coffee maker, because soap binds with coffee oils and is impossible to clean out, and baking soda can clog and ruin your machine. You can use any multipurpose cleaner to wipe down the plastic or stainless shell, though. Most manufacturers recommend that you use this method to clean your machine every week if you use it daily.